Marvin’s story is impressively chronicled in author Dwayne Epstein’s LEE MARVIN POINT BLANK…following two decades of meticulous research. Not content to simply parrot information from others, Epstein took the time to interview Marvin’s family members, his attorney, agent, and several co-stars and directors. Christopher Marvin, the actor’s only son, contributed an afterword shortly before his death in 2013. David R. Greenland, “What’s Out There” CLASSIC IMAGES Magazine, October, 2017. I’ve never read a better researched actor’s bio. Mr. Epstein brings Marvin back to life. What Herculean labor! What an accomplishment. What an authentic, entertaining read! Via Amazon: Very good JOB! Very enjoyable read for me. I respect that Dwayne Epstein used all the available material to discuss Lee Marvin’s military service and did not fabricate what many might imagine to have happened that was not documented. Just as it is with so many who served, it is the letters home, kept and shared which provide a peek into all that can go on in combat. As a combat veteran, I resent it when authors go beyond what is available to manufacturer what only can be imagined beyond what is written. We all know Lee Marvin experienced pain, anxiety, even fear, but for anyone to suppose the degree to which he felt all the emotions a combatant experiences and then elaborate to juice up a story is not being honest with the subject. Dwayne Epstein laid out the resources he scoured for and let the reader add conjecture. The stark differences between how his letters to his mother and his brother Robert were written certainly offer insight into those relationships, and Dwayne Epstein could have gone beyond what he had to satisfy those who wanted more facts than were available, but the author stayed his course as a biographer and didn’t venture into becoming a novelist. Anyone who has experienced combat can spot fabrication and I saw none. I wish more information was available. I wish a camera and sound had been right with him throughout his service, but it was not. The author was very good in tying the similarities of the different stages of Lee Marvin’s life together. The traumatic youth which folded right into the trauma of war at a time when no one knew or explored PTSD is not lost on the author as he kept that thread, really it was the fabric of Lee Marvin’s life at the forefront. Lee Marvin was a survivor and this book told of how he survived a very difficult childhood and continued to survive on throughout his life to learn from it to become successful in his career. His life was tough, and he made it tougher than it needed to be, but Lee Marvin could only build on what he had. I gathered a great deal of insight into this intricate personality by the skill of the author. I checked the book out on a whim from the library and once finishing it, I just ordered it to include in my collection. I will be proud to add it to my shelves and to pull it out and re-read again as time goes by. I am always happy to find a talented author who stays true to his craft! 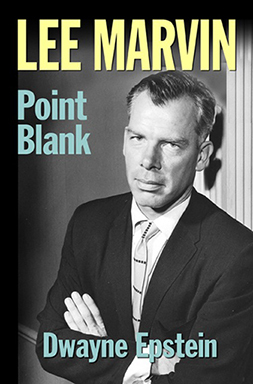 “Author Dwayne Epstein’s newest book, LEE MARVIN: POINT BLANK, is a detailed and accurate account of the good and not so good chapters of Lee Marvin’s personal and professional lives, off and on the screen. This is an in-depth study of one of Hollywood’s near mythical character actor/ leading man hybrid personas that compares favorably with Cagney, Bogart and Eastwood. The book is at once an in depth study and as well as a highly readable and entertaining overview of one of Hollywood’s most endearing and enduring action stars.” – Tracy Wynn, Screewriter of The Glass House (1972), The Longest Yard (1974), The Autobiography of Miss Jane Pittman (1974). Author Dwaynet Epstein’s Point Blank is a riveting read, meticulously researched and beautifully written, so very honest detailing the complexities of Marvin’s success, failures and weaknesses as a man. What sets this biography apart is the author’s knowing his subject from birth to death, with special attention to what doubtless created the devils forever churning inside him – the Marines, the Pacific, the war, kill or be killed. By the time Epstein has taken us through WWII, he has injected such genuine empathy for Lee Marvin, that this reader knew he was in a hands of a brilliant biographer. I eagerly await his next subject! Jeb Rosebrook, author, screenwriter, Junior Bonner (1972), I Will Fight No More Forever (1975). Larry Karaszewski, award-winning screenwriter of Big Eyes (2014), Man on the Moon (1999),The People Vs. Larry Flynt (1996) and Ed Wood (1994). “Dwayne Epstein may not have intended to spend nearly twenty years working on a biography of Lee Marvin, but had he not started in the mid-1990s he would have missed the opportunity of interviewing the actor’s older brother, many of his directors (from Sam Fuller to John Frankenheimer), and an even greater number of friends and costars. With tireless research and access to so many people in Marvin’s orbit, including his lawyer, his longtime agent, and his first wife, Betty, Epstein has crafted a thorough, intimate, and highly readable portrait of this imposing actor who became an unlikely star. ……Marvin was a complex man. He was proud of his service during the war, but it left him with problems that, Epstein speculates, might be classified as Post Traumatic Stress Disorder today. His erratic behavior, indifference to fatherhood, and often-crippling reliance on alcohol strained some relationships and destroyed others. He took pride in his craft, however, and despaired over the eroding quality of Hollywood movies in the 1970s and 80s; he worked less and less, and ultimately said yes to some mediocre projects that weren’t worthy of his talent. EDDIE DEEZEN, Actor from I Wanna Hold Your Hand, 1941, Grease, The Polar Express, etc. “As a young teen, I went to see Brando in The Wild One. I left talking about Lee Marvin. I truly enjoyed Lee Marvin: Point Blank. It enlightened me on who the man was. Some of you may know I’m an actor. I could relate to a lot of the stories. Especially when he was a NY actor and ‘making the rounds’ and doing live TV. I was unaware that he had been a New York actor. RON THOMPSON, star of Ralph Bakshi’s American Pop and award-winning stage and film actor. “It being Valentine’s Day, I can think of no more romantic way to waste the day (before I get to work) than by dipping in and out of a tender, caring, just-published biography of America’s former sweetheart, Lee Marvin. In Lee Marvin: Point Blank, written by Dwayne Epstein, the action star who terrorized the West with a bullwhip in The Man Who Shot Liberty Valance, taught a squad of murderers and borderline psychos how to love again in The Dirty Dozen, and let Angie Dickinson use him as a punching bag for her furious little fists in the movie that gives this bio its subtitle weaves through the pages like the big rangy scary cat he was. I’d often wondered why Marvin and director Sam Peckinpah never worked together in movies. Such simiarities. Both tough ex-Marines, both heavy intakers of alcoholic content, both volatile, both white-haired with a silvery patina to their appearance. Maybe it was because their experience shooting a TV’s Route 66 killed off any chance of bromance. It’s never good to work woozy, however, and during this episode there was a fight scene with Martin Milner where one of the actors zigged when he should have zagged and the result was a punch that split Marvin’s nose wide open, the resulting damage putting his career in jeopardy. He was fortunate, notes Epstein, that The Man Who Shot Liberty Valance was shot in black and white, masking the discoloration. The pages devoted to Donovan’s Reef, the “rollicking comedy” (an extinct genre) that reunited Ford, the Duke, and Marvin, confirm the impression that I acquired at an early age that Donovan’s Reef is one of the booze-bathed movies of all time, a sot’s vision of tropical paradise. “For tax reasons [Ford] had to sell his beloved yacht, The Araner, so he decided to use it in the movie before selling it off, and figured he could have a good time drinking on board during the film.” This is the sort of consideration that seldom comes up in film-studies courses. As it turned out, Ford wasn’t allowed to drink for health reasons, so he “had to referee” while Wayne and Marvin went watery-eyed. [Following the airing of The Dirty Dozen] “Of course, it’s no secret that Lee Marvin’s rough and tumble persona onscreen was matched, if not surpassed, by the the rough and tumble life he led offscreen. According to the this new biography, Lee Marvin Point Blank by author Dwayne Epstein, most of the time spent by Lee when he wasn’t shooting The Dirty Dozen in England, was spent in one English pub after another, where many pints were consumed and several bar fights ensued. 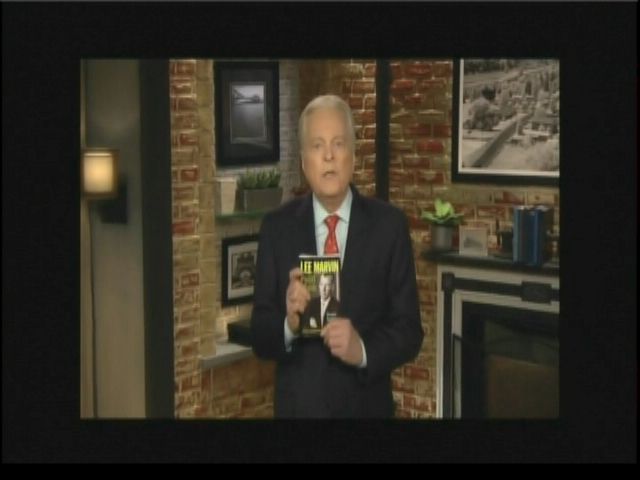 Robert Osborne, Film Historian and on air host of TCM.